Anritsu ML2488B : Power Meters - Test Equipment Connection - Prüfgeräte zu verkaufen - verpachten - vermieten. Color Display: Display more information from the measurement on the high resolution color display, a first for this class of power meter. The user can choose to display the results on a graph or as a numerical readout. Dual or Single Input: The ML2487B is a single input power meter and the ML2488B is a dual input power meter. The ML2488B supports A,B and ratio measurements A/B for amplifier and return loss measurement applications. 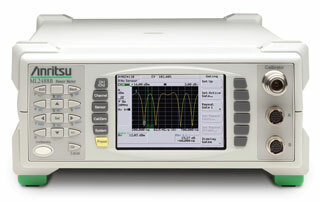 Dual Channel Display: The ML2480 series can display two measurement configurations on its dual channel display. Measurement Gates: The ML2480 Series has multiple gate measurement features that enable the accurate capture, display and measurement of systems with multiple pulses such as radar, radio location and communication systems. A choice of tabular readout or graphical profiles can be used to measure and display the power in each gate. 8 gates can be set in a repeating pattern for TDD (GSM, GPRS, TD-SCDMA, etc.) applications. Limits Testing: The ML2480 Series offers two types of limit testing: simple pass/fail limits for CW applications, and complex profiles for pulse testing. Save and Recall: Save up to 20 instrument settings. Radio System Presets: Preset settings for major wireless systems enable the user to configure the power meter quickly and easily. Secure Mode: Remove frequency-sensitive information from the power meter.